“Some boast of chariots and some of horses; but we boast of the name of the Lord our God………oh that You would rend the heavens and come down, that the mountains might quake at Your presence as when fire kindles brushwood and the fire causes water to boil to make Your Name known to Your adversaries, and that the nations might tremble at Your presence! I ran across these passages this morning and I wanted to share briefly on why every family and every person should raise this banner over your front door. 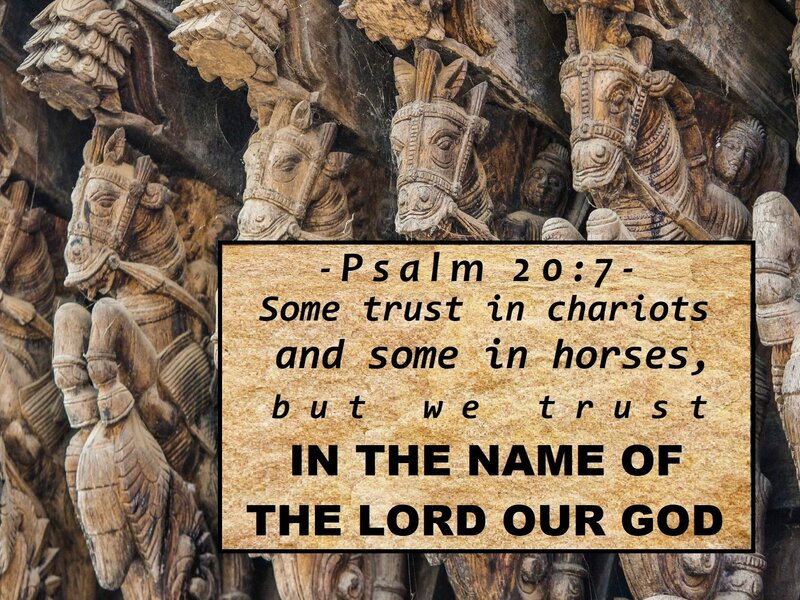 “We do not trust in horses, we do not trust in chariots, we trust in Lord our God” means that God works for people like that……like those who trust in His help only. And if God is working for you, surely things will turn out better than they would if everyone else in the world were working for you, but not God. If God is undertaking the initiative to search out for us and help by working for us, it’s not possible He has, can, or ever will fail. In our seasons of waiting on God, my wife, Patty and I have learned valuable lessons from Him that motivate us to do more of what He has revealed and we have discovered that while waiting. He taught us the value of doing something. We got closer to hearing His voice in more prayer and as we made prayer a priority alongside the reading of His Word, as He spoke into our hearts, we began to trust Him! I mean REALLY trust Him! Because, it’s not about what we can do for Him, it’s about His desire to want to work for us, in our lives. That was awesome, Marty. Very well said and definitely worth reading and following. Because it’s all about following Jesus and obeying Him.